this is Deron's mummy. we (including my guests) all loved the cake!! very nice! 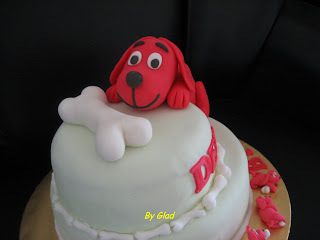 it compliment very well with Clifford mascot. and the cupcakes, everyone complimented it is very lovely. Thank you so much for taking your time to give me this feedback. Would also like to thank you for the input on the cake design. Glad to hear that it went well with the mascot. BTW, Deron is so cute and cheerful! He even smiled to me when you collected the cake. Yes, he knew you are the one baking his cute and lovely cake. He keep pointing at the cake and keep wanting to come over to touch the cake. He loved the cake too!! by the way, how do i preserve the red dog. I kept it in the freezer. cant bring myself to throw the dog. very cute! 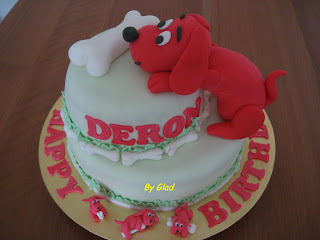 I'm so glad to hear that Deron loves the cake. I'm afraid that you are not able to preserve the big dog.... I've emailed you. i was wondering whether it's ok if i link you? Sure you can Sweet-tooth. Thank you.